Tag Archives: rip out the Federal Pacfic’s! Waldron Electric Rips out thousands of Fuse boxs a year! Year after year goes by , people give their furnace attention and some even their central air a good clean and check. But what about the electrical service in the home? Do wires last forever? Can wires loose continuity? Can wiring simply fail due to age? Can old wiring cause fires? How could it? Hi I’m Tom Waldron. PA State Certified Electrical Inspector and owner of Waldron Electric Heating and Cooling. Many homeowners get the furnace and air checked yearly, but neglect their electrical system. Loose wires can cause small fires, resulting in larger ones. Old receptacles, extension cords and old light fixtures breed electrical problems. The life expectancy of these devises are about 7 to ten years. As they get used, the heat from the light bulbs and the constant in and out motions of plugging something in and out of the receptacles cause loose connections and the insulation to break down, causing a potential arc-fault, which is essentially a very small fire in the devices and light fixture connections. Standard fuses and circuit breakers do not detect this type of deficiency. Newer homes come standard with arc-fault protection to prevent fires. Where older homes run the risk of a catastrophic outcome if their electrical system is not maintained. Standard circuit breakers do not offer this arc fault protection either. If you or someone you know has a Federal Pacific breaker box, it shoud immediately be changed out to a newer circuit breaker system due to a national government recall. 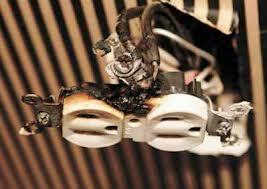 What causes Electrical malfunctions and fires? Waldron Electric says Ripping out fuse box’s is the right thing to do! Federal Pacific Breakers – A Possible Fire Hazard?